With its back to basics picnic tables, perma-warmed sausage rolls and mock results-awaiting student servers, The Pavilion put me in mind of a seaside caff. Not that there's anything wrong with that. To complete the picture, you'd expect each external umbrella (ella, ella) to carry the logo of a sugary water manufacturer. 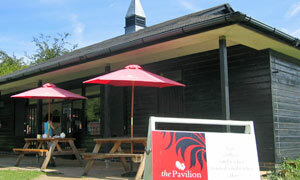 Not so: they have their own posh pink personalised Pavilion parasols. Help, I'm turning into Leonard Sachs. Kingston Field, for that's where we are (see map), is fab for the kids. Mahoosive green space in which to chuck around a Wham-O, quality play area c/w commando slide and swings a-plenty, a mini Astroturf-ed footy pitch with goals (and the odd sick rabbit) on which to kick around a Lunar Jim ball, and even a basketball hoop that they'll never reach. And when they've run themselves ragged, it's a dad'll-get-there-first run over near the tennis courts for Solero Shots and Magnums from the obligatory ice cream freezer. Plus there's the odd train rattling past to beguile males of a certain age. There's savoury too in the form of made-to-order sarnies, cold or toasted. I went for cheese and pickle -- er, sorry, no pickle -- make that cheese and ham. It emerged Breville-tastic. Garnish? What garnish? Acres of activity to focus on as you munch. Odd game of French cricket, lads knocking a ball back and forth (thinks: if that comes over here, I'll roll it back to them), and toddlers attempting to escape the clutches of their mothers. This particular one made it on to Kingston Farm Road, narrowly missing a car, scarily enough. My pot of tea took some beating with its twin bags and jug of real milk -- no UHT sachets here, no sirree -- heaven must be missing a slab of Angel Cake. If you like your pleasures simple, park yourself at The Pavilion. If it was a car -- Saab 99. If they were passing by -- Nigel Kennedy.